This stole is an attempt to re-envision how a gradient could be used. Instead of working in the typical order I have used the different colors in the set to create stripes with varying levels of contrast. 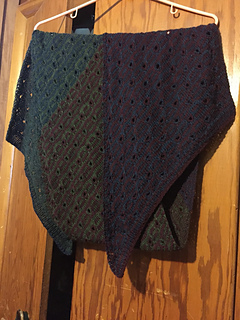 To allow the gradient to shine I have paired it with a simple to knit combination of mosaic style color-work and lace that provides just enough interest to keep the piece and the knitting fun. 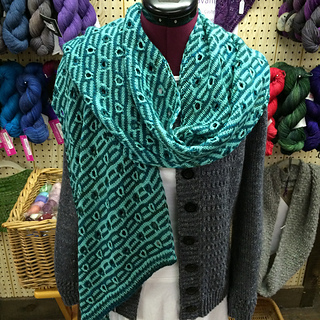 The sample was worked in the beautiful gradient set Carmen from Miss Babs, but any of her 6 skein gradient sets would work perfectly. I cannot wait to see what different colors knitters put together. If you would like to see a video tour of the stole you can check it out on my YouTube Channel here. 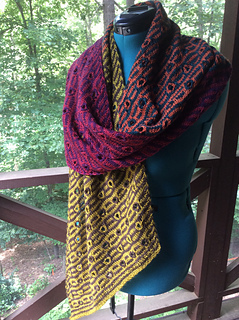 The pattern contains simple decreases, double yarn overs, and slipped stitches. For an experienced knitter it will be TV knitting and entirely workable for an advanced beginner.